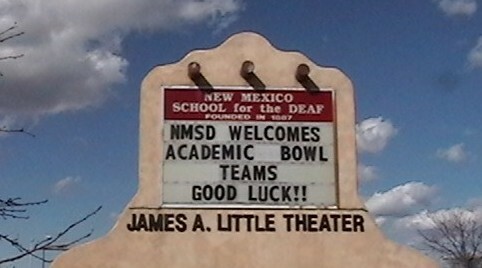 The Southern Oregon ESD Program for Deaf and Hard of Hearing sent a team of four students and two coaches to Santa Fe, NM for the annual Deaf and Hard of Hearing Academic Brain Bowl competition in March. The team earned money to finance the trip by seeking donations from several businesses and private individuals across three counties. The students attending were Team Captain Monica Alfaro—senior from Henley High School in Klamath Falls, Mike Mapes—sophomore at Phoenix High School in Phoenix, Ricardo Camacho—freshman from North Medford High School in Medford, and Jacob McGuire Whitaker—freshman at Glendale High School in Glendale, Oregon. Coaches were Head Coach Sharon Hunt, Resource Teacher in Klamath Falls, and Assistant Coach Libby Baker-Watson, Itinerant Teacher in Jackson County. Students' responses were not given orally. Answers were written and projected on a screen. Therefore, spelling, handwriting, grammar, capitalization, and punctuation became critical to gain points. This approach focuses on mastery learning for our students. Sixteen teams from the Western Division attended. Nine were schools for the deaf, one was a day school, six were mainstreamed schools. There were nine states represented in the Western Regional Competition: three from mountain states, three from the Southwest, four from the Pacific Northwest, five from California, and one from the Pacific. History: What name was given to the companies of militia organized at the time of the American Revolution? Health: What is the leading preventable cause of intellectual disability? Sports: Name the US 1993 figure skater who was given a spot on the Olympic team despite being unable to continue in the US trials because of an attack on her leg. The students were able to meet other students from other programs and learn that they are not the only ones who are hearing impaired. Many of the students attending go on to attend college and seek graduate degrees. We had a short time for sightseeing. Just outside of Albuquerque, we were able to go on the Sandia Peak Tramway, where we could see over 11,000 square miles of New Mexico. The tramway has the longest distance of suspended cable in the United States, spanning just over 1 mile between support towers. We were also able to hike through Petroglyph National Monument and see stone carvings from centuries ago. We learned some of the native names for birds and animals and learned of the culture, agriculture, and hunting from that time period. The architecture in New Mexico is different from our own here in Oregon. The housing structures had rounded corners and flat roofs. The colors ranged from browns and tans to ruddy adobe. While it appears to be desert, there are few cactus. Our trip was jam-packed with activity from the time we boarded the plane to the setting sun when we returned home. All of the returning students have expressed a desire to work hard, practice, fund raise, and go again next year. Next year’s brain bowl will be held in Tucson, Arizona.